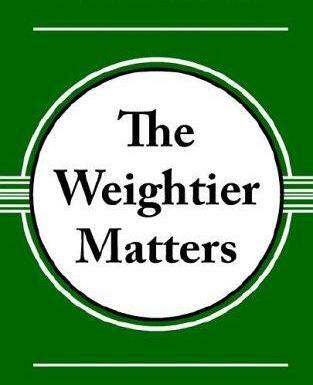 What are these “Weightier Matters” that Yeshua admonished the Pharisees for ignoring? Are we falling into the same trap? Mat 23:23 “Woe to you, scribes and Pharisees, hypocrites! Because you tithe the mint and the anise and the cumin, and have neglected the weightier matters of the Torah: the right-ruling and the compassion and the belief. These need to have been done, without neglecting the others. Luk 11:42 “But woe to you Pharisees, because you tithe the mint and the rue and every plant, and pass by the right-ruling and the love of Elohim. These you should have done, without leaving the others undone. Let’s be sure we understand the definitions of these words first. I’ll be honest, I don’t see a whole lot of charity, compassion, and benevolence being shown lately. We all seem to have our own version of the “truth” and if others don’t believe exactly as we do, we dismiss them as being lost. We are all very busy correcting people about their pagan holidays, Sabbath, and Greek thinking… but I have to ask, are we sharing this wisdom with love, meekness and humility? Jas 3:17 But the wisdom from above is first clean, then peaceable, gentle, ready to obey, filled with compassion and good fruits, without partiality and without hypocrisy. Jas 3:18 And the fruit of righteousness is sown in peace by those who make peace. Pro 15:1 A soft answer turns away wrath, But a harsh word stirs up displeasure. So, it was a walk, a growing into knowledge, wisdom and understanding of Torah. Why then do we feel the need to burden new believers (or even old believers who have a new understanding of the importance of Torah) with our constant berating about how they are not doing some aspect correctly? We cannot open their eyes or ears, only YHWH can and it is on His time table. Deu 29:4 “But Abba has not given you a heart to know and eyes to see and ears to hear, till this day. Where is the humbleness that Mosheh and Yeshua displayed? Num 12:3 And the man Mosheh was very humble, more than all men who were on the face of the earth. Psa 138:6 Though Abba is exalted, He looks on the humble; But the proud He perceives from a distance. Pro 11:2 Pride comes, then comes shame; But with the humble is wisdom. Mat 11:29 “Take My yoke upon you and learn from Me, for I am meek and humble in heart, and you shall find rest for your beings. Why are we so busy inspecting the walk of others but ignoring our own fruit? Gal 5:22 But the fruit of the Spirit is love, joy, peace, patience, kindness, goodness, trustworthiness, Gal 5:23 gentleness, self-control. Against such there is no Torah. Have we forgotten that Yeshua did not debate and correct the masses? He didn’t even explain the parables to them. Mat 13:10 And the taught ones came and said to Him, “Why do You speak to them in parables?” Mat 13:11 And He answering, said to them, “Because it has been given to you to know the secrets of the reign of the heavens, but to them it has not been given. Mat 13:12 “For whoever possesses, to him more shall be given, and he shall have overflowingly; but whoever does not possess, even what he possesses shall be taken away from him. Mat 13:13 “Because of this I speak to them in parables, because seeing they do not see, and hearing they do not hear, nor do they understand. Therefore, I would like to challenge us all to think this through, are we ignoring the weightier matters of Torah just like the Pharisees did? This is the first time I’ve read your blog, I followed a link from a friend of mine who believes as you do. Thank you for this teaching. Your words of gentleness towards people like me, a follower of Christ who never heard of this OT teaching until recently, were a blessing. Some other sites/comments I’ve read on the subject are so condemning of non-Torah following believers. Most of us are true lovers of Yeshua who have not heard this message before. If you condemn us without teaching us, if you hurl rhetoric without the “spices,” you turn us away from the truth you hope to share. Kim, you have blessed me so much! Be watching for an email from me later this weekend! Blessings to you and your family!!! I’ve been waiting for an email! Would love to talk to you more! This is very gentle and encouraging and convicting. Todah robah! Right off of the bat, let me apologize for the length of my comment. I know this is an older post, but I just came across your blog and this specific post is a blessing! After spending a number of years in an emotionally and spiritually abusive church that left me and others trapped in legalism and feeling like we could nearly impossibly do enough to be accepted by G-d, it’s been a process of learning His love a freedom again. I started to learn about our “roots” in order to gain correct interpretation of scripture as I was at a point of not trusting the Word because it had been twisted. In doing so, that same legalistic spirit followed me as I was learning about the Torah and it’s instructions. I was tormented with anxiety and fear. I was not understanding correctly what was expected of me and felt like digging into the roots and it’s practices laid out in the Torah was making things more overwhelming. I started to step away from things and asked Holy Spirit to lead me into Truth. Over the years, He has helped me with legalism, fear and anxiety. As I continue to delve into our Jewish roots I have come across the harshness that you mentioned from other Messianic believers. Your post was refreshing as there are many of us that want to learn, but for those “ahead” of us, I desire for them to know that we are “babies” to this. It is a lot to take in! Not only new terminologies, but learning of a different culture of a different time. And, yes, there is “unlearning” that takes place, too. Centuries of traditions that have spawned other traditions that were not the original traditions. This last year, we weakly celebrated Hanukkah with our girls, hoping to eventually learn to celebrate the ordained celebrations. And, yes, we did celebrate Christmas, too. We don’t do Santa, but we emphasize the gift of Yeshua (although we still call Him Jesus, mostly) because most of the people around us know Him as Jesus and in most instances I feel we would create distance rather than unity with others if we just go around using all of the original names and terms. We live in a rural community and I’m not even aware of how close the nearest Messianic congregation would be, but I’m nearly certain it’s at least 3 hours away. This year, we are looking into Passover, but I’m sure we won’t do everything “right”. We are trying. And we are trying to emphasis the heart behind it, not just going through the motions. We are taking this as a slow-learning process, but enjoying it as we venture onward. All this to say, again, thank you for sharing with GRACE and LOVE! Those, I believe, are the keys to draw more people into loving His Truth! Wow… thank you so much for your beautiful encouraging response. I am sorry it has taken me a few days to see it! I have been feeling this need for a bridge between the two (Judaism and Christianity) for five years now and have felt the wrath of both sides. When someone tries to insist that I interpret scripture “their” way, I run. We are to encourage folks back into the Word not to follow us! I am thankful to have you join with me and my family in studying and learning the Word together! I hope you will continue to join in! I also am the administrator of a couple of groups on Facebook that might be of interest to you. My email address is Trish (at) LiveAndLearnFarm (dot) com. email me if you want me to send you the links or to chat. Thank you so much for taking the time to write this note to me! Know that you were a blessing to me today!